What all of these ideas share about the arts, and the artist, is their point of origin where an idea either rises out of playing the blame game or out the desire to awaken awareness. In the past, when I’ve opted for playing the blame game (even with it’s bittersweet hit of instant gratification), that choice inevitably leads me away from the sparkling, snow-capped summit of my dreams. But when I remember to align my creative instincts with awakening awareness, that choice never fails to help me breathe more deeply and climb more easily even as I sometimes stumble and fall over the rocks in my path. Strings?… What Strings?… I Don’t See Any Strings! For a long time now, I’ve been haunted by a sense that invisible puppet strings direct the course of many artist careers as, step by step, artists work harder and harder to ascend closer to their creative peak. What the puppet master, hidden behind those clouds hovering at the top, wants most of all is for each of us to ignore these strings, to pretend they do not have the influence they, in fact, have. Or, as this anonymous quote reminds us, it is what we choose to NOT observe in our life that controls our life. Principles: the values, beliefs, and basic assumptions we hold. Principles are tricky because they develop over our life time and are mostly unconscious trigger points for how we respond, moment to moment, to what’s happening. We seldom question, or even articulate, the principles by which we live because they have been interwoven into the fabric of self so completely and seamlessly. Once in a while, when one of our principles smacks into someone else’s principle, we become aware – for a moment – that we are reading a situation very differently from someone else, or perhaps that we are aligned with someone else. But this is rare. Principles like to keep their influence under wraps. They resist detection under the guise of protection that is really about deflection. And, like anything we become aware of, principles can move out of the shadows and shine a light on the very things we want most to accomplish in our lives. Once you identify, articulate, and embrace the principles you most want to support your art career, those puppet strings go slack, you observe your efforts without resistance and your choices without judgment, a spring returns to your step, and there are wild flowers nodding to you as the summit glows nearer. My goodness, sounds good… but what principles (aka, more ideas) have this kind of impact? A manifesto has a single job description: to identify and clarify principles that help you see where the gap is between what you believe, and what you are living. And in this revelation, you have the opportunity to align more closely with what you most desire. 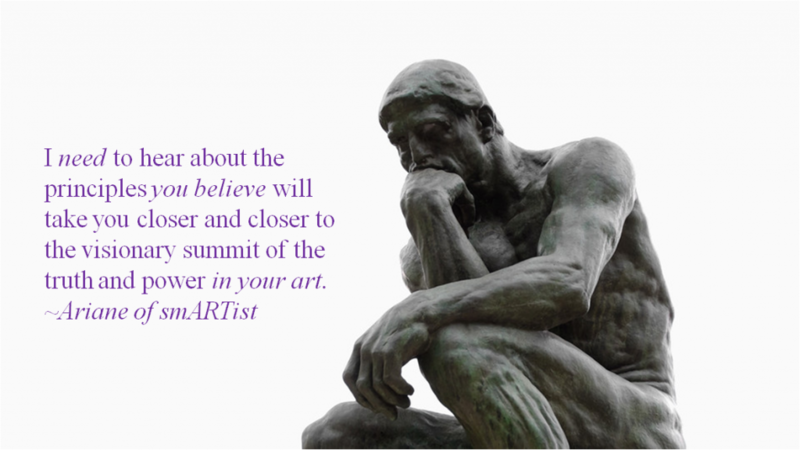 In my Manifesto For Visual Fine Artists, I wanted to identify and clarify principles to help you align your art career with Awakening Awareness so the climb leads you closer and closer to the visionary summit of the truth and power in your art. And then I realized how Big this Idea really was, and that I couldn’t just write a manifesto and wander off into the horizon. I realized I need all of us in the conversation, and what better place than the blog? … where next week, I’ll release my entire Manifesto For Visual Fine Artists [watch for it]. Then, together, we can tease it apart, you can add your comments, and we’ll co-develop an entire practice intentionally, bringing as much of our consciousness to bear as possible, on the most effective foundation for a successful career in the visual arts. Because, the more successful you are, and the more intentional consciousness you bring to bear on your journey to that summit of success, the greater our chances of shifting the collective consciousness into connecting with the true value of the visual arts. This is the work of all of us. And it’s big work (some might say impossible work). But, can you imagine a world in which our collective consciousness has shifted so the visual fine arts are fully valued, and take their rightful place in the 21st Century as one of the Four Pillars of Civilization that they are, and have always been? Can you imagine the impact this would have on each person alive as they connected to the web of creative expression that visual artists, in particular, know how to weave? Gives me goose bumps just to write that. But for this week, let’s start from the only place we can: where we are. And for this, I need you. I need the web lines of connection to aliveness that you bring every time you show up and add your voice to the conversation.